The Devil Speaks True: The Sherling Studio, Lighthouse, Poole. 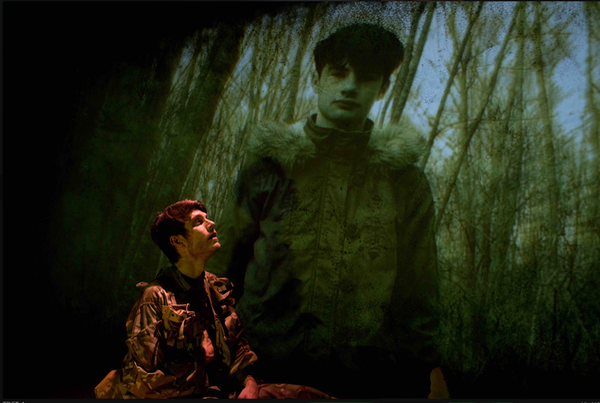 This extraordinary work of immersive, sense-around theatre plunges its audience into the anguish of dealing with war. In a blacked out auditorium with 360 degree sound, courtesy of individual wireless binaural headphones, we were invited to explore the human fallout from the psychological trauma of the battlefield. Yet this production from Goat and Monkey Theatre also draws heavily from Shakespeare, specifically Banquo in Macbeth. While we listened to the recorded words of real veterans of the war zones of Iraq and Afghanistan we were bombarded with the sound of explosions, flashes of light, smells and screams of terror as men - even those who escape physical injury - are left lost, frightened and confused. With images on a giant backscreen, parallels are drawn with loyal Banquo’s experience of combat and his journey from battlefield to banquet. There is essentially only one performer on stage, the wonderfully named Ripp Greatbatch whose character writhes in mental and physical agony as war puts him through an unimaginable mixture of extreme danger and stress. Complete with obligatory witches and Shakespeare’s original text we find that Macbeth describes only too well the pain of Post Traumatic Stress Disorder. So too do the words of Lance Corporal James Griffin, RAF veteran Tom Stimpson and Peter Moore an IT man held hostage in Iraq for two-and-half years. Numbing isolation and feelings of emptiness, shame and fear can seem constant companions. The message is clear. While many learn to deal with their demons, there are far too many combat veterans who come home unable to cope. They may be celebrated as heroes but feel like ghosts at their own banquets.